Climate change will likely lead to the spread of animal-transmitted diseases throughout the North, putting children at increased risk of disease.4 With remote health services in the North, illness, especially if widespread or epidemic, is of particular concern. 1Government of Canada. (2013). Canada’s Sixth National Report on Climate Change: 2014. https://ec.gc.ca/cc/16153A64-BDA4-4DBB-A514-B159C5149B55/6458_EC_ID1180-MainBook_high_min%20FINAL-s.pdf-accessed March 5, 2017. 2Berry, P., Clarke, K., Fleury, M.D. and Parker, S. (2014): Human Health; In Canada in a Changing Climate: Sector Perspectives on Impacts and Adaptation, (ed.) F.J. Warren and D.S. Lemmen; Government of Canada, Ottawa, ON, p. 191-232. https://www.nrcan.gc.ca/sites/www.nrcan.gc.ca/files/earthsciences/pdf/assess/2014/pdf/Chapter7-Human-Health_Eng.pdf-accessed July 24, 2017. 3Furgal C. Health impacts of climate change in Canada’s north. Rep. No. : H128–1/08-528E. Ottawa, ON: Health Canada; 2008. 4Lemmen, D.S., Warren, F.J., Lacroix, J., & Bush, E. (2008). 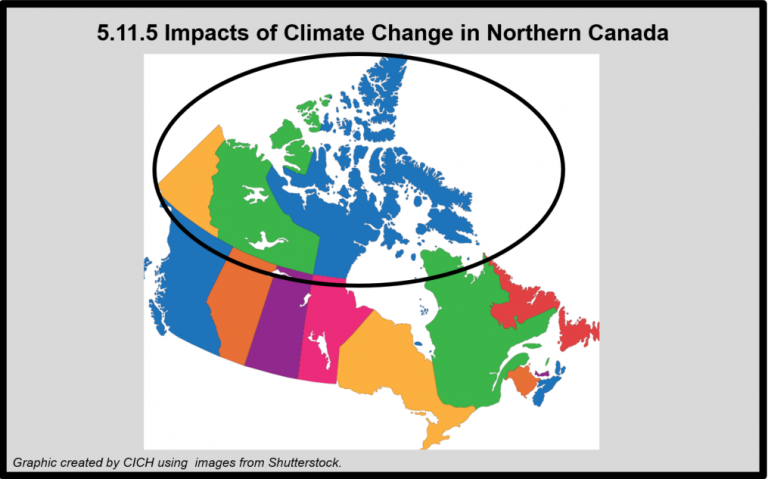 From Impacts to Adaptation: Canada in a Changing Climate 2007. Government of Canada, Ottawa, ON, 448. https://www.nrcan.gc.ca/sites/www.nrcan.gc.ca/files/earthsciences/pdf/assess/2007/pdf/synth_e.pdf-accessed July 24, 2017.